It’s been quite some time since I last posted on this blog. I am hoping that the kind readers who read my posts in the past will forgive me and participate again. By participate I mean not only read what I’ve written but respond with comments. It‘s those comments that validate my efforts and let me know that I have something to say. Having been though the warmest recorded winter/year in Michigan it was only a matter of time before Mother Nature said “Don’t get used to it”. This past week we got the message when the temperature plunged to around zero and I decided it was time to get the wood burning stove fired up. When I bought my house years ago it was one of the feature that came with the addition on the back of the house. The down side is that when it get on the cold side in winter we need to burn wood to keep the house warm. 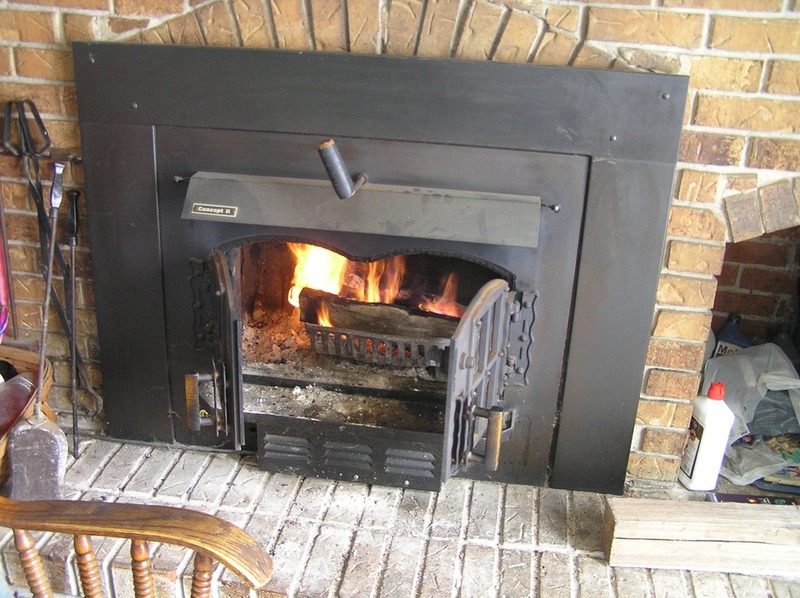 I remember one winter where the temperature stayed below zero for a month and I kept the fire going continuously the entire time. One winter our stove (gas) needed to be replaced and rather than rely on takeout while replacing it I got asked myself “What if I tried cooking in the fireplace?”. So I marinated some boneless skinless chicken breasts, dragged out the cast iron skillet,set it on the fire logs and,low and behold, I cooked up some awesome chicken breasts. I mean I was truly impressed/inspired! Since then I’ve cooked chicken breast,pork chops and roasted fish (mahi mahi). I‘ve also done the accompaniments (potatoes,vegetables etc…) and everything I‘ve done has turned out well. The food took on a luscious,smoky taste. Recently I got extra ambitious and decided to try a whole chicken. As with everything else I have cooked in the stove the trick is to keep it from burning. 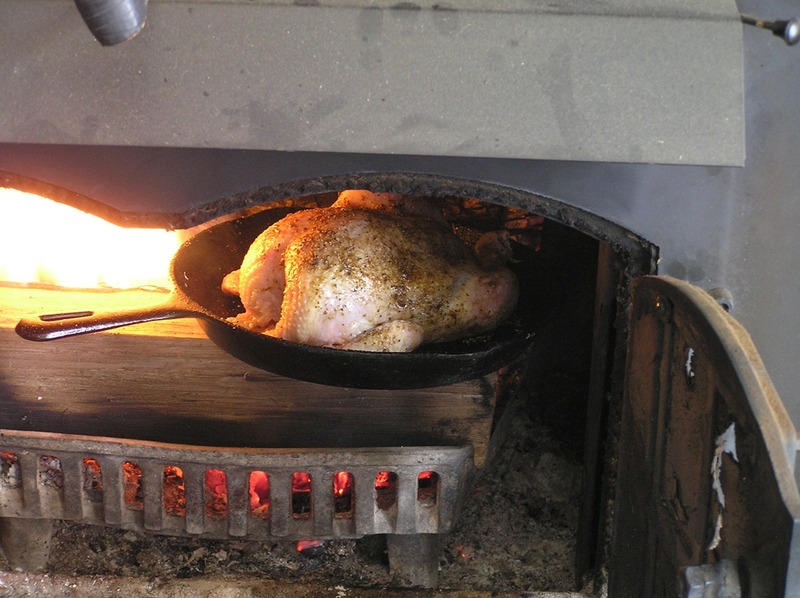 This requires almost constant attention as there are a lot of variables when working over an open flame and in the wood burning oven. I began by spatchcocking the chicken. 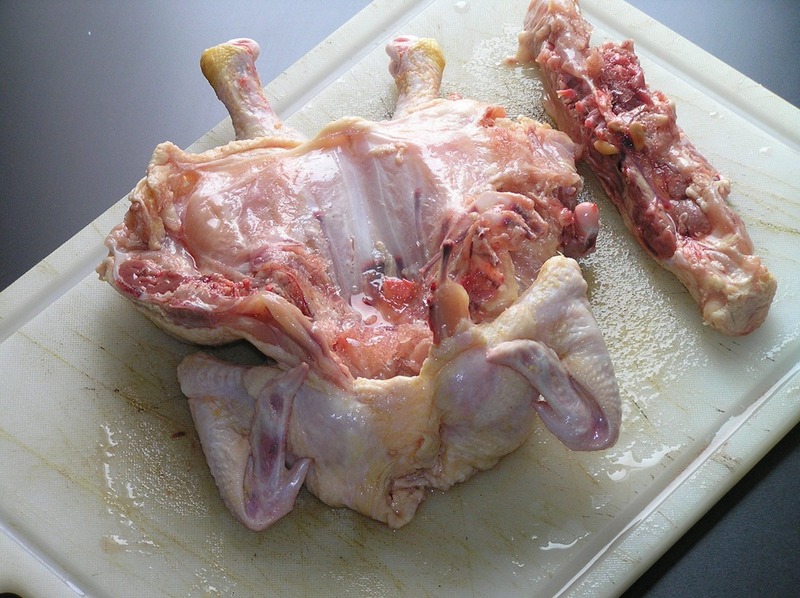 While this sounds like it could be complicated what it means is to remove the backbone of the chicken for roasting. I just uses a pair of kitchen shears and cut it out. I brought the ingredients to a boil and allowed it to cool completely. You could do this the night before and just leave it on the back of the stove (covered). 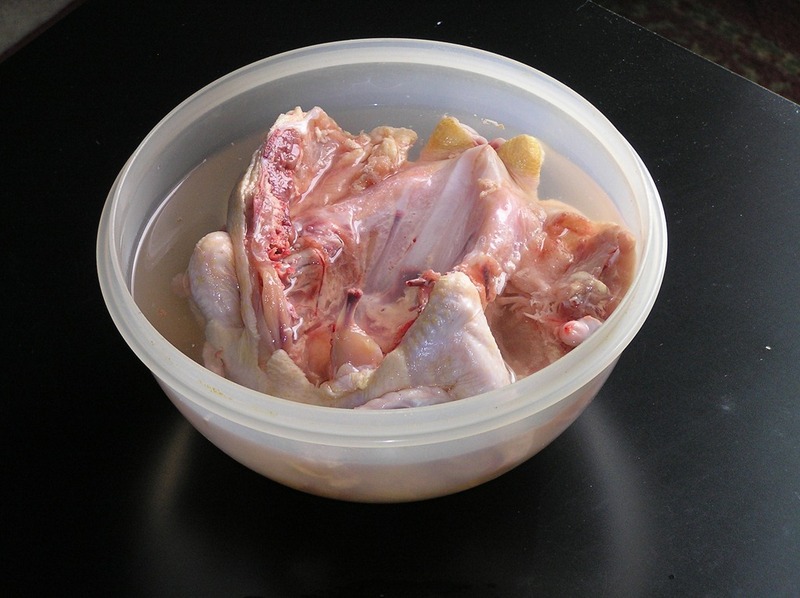 I then marinated the chicken in the brine for 3-4 hours (refrigerated). After which I towel dried it and sprinkled it with a mix of salt (little), cumin and black pepper. Not to miss a step but I had already gotten my fire going a couple of hours before to make sure it was good and hot. 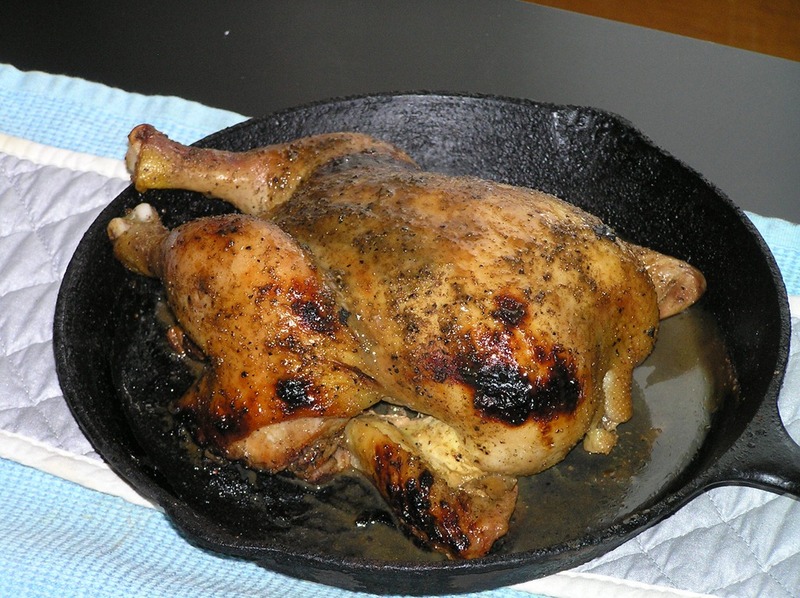 I then placed my chicken in the cast iron skillet and set it in the oven,making sure it was close to the flame, but not directly on it. I then closed the doors and let the magic happen! Not wanting to oversimplify the process it bears saying that I checked it every 5-10 minute making sure it wasn’t burning and that it sat level on a log. I also added white wine and water to create pan juice to baste with and control the heat under the bird. Constant shifting and turning were part of the drill. I also used my thermometer (calibrated) to make sure when my chicken was done. One and a half hours later I had a bird that any chef would be envious of. I mean when you go to that 4 star restaurant and they have roast chicken on the menu ($25.00 and up),this is what you get (although maybe not as good). For those of you who say “I can’t do that!” you can still brine your bird. You can maybe try it on the grill outside when the weather gets warmer. the important part is to have fun with the experience! I know not everyone has the equipment to take this on but cooking is an adventure and the journey is what make the experience memorable. Thanks for Checking in! I am still working in Grand Rapids and, as I love to do, explored the local food scene. I found a Vietnamese bakery that serves up a respectable Bahn Mi Sandwich and something call a snowball ( Chicken Vegetable and egg steamed inside a bread dough). Most recently there was an Indian grocery nearby that had Potato and Pea Samosas that were outstanding. The balance between the potato, curry and lime was beyond description. I know they were not made there but someone is making an excellent product. I had 4. On July 4, 2010 I returned to my home in Eastpointe for a few days of Rest & Revival. Due to my late arrival my wife and I had an impromptu feast featuring some Ribeye steak, Hebrew National Hot Dogs,Grilled Romaine ( with Maytag Blue) and sautéed grape tomato with fresh basil and Olive oil. 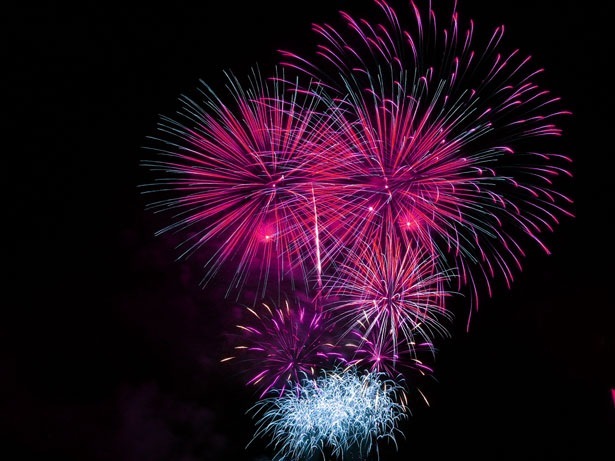 The evening finished with a very pleasant fireworks display supplied by several of our neighbors. “Today is the actual Grilling Day/Holiday for me. As much as I enjoy my steak and salad the call was put out for salmon! Up to the challenge I came up with a menu. Salmon(Cedar planked) , Dilled Redskin Potato Salad and Grilled Corn. Cedar (or planked) Salmon is a method acquired from the native Americans who attached there fish to a wood plank before placing them near the fire to cook. For the Salmon I was fortunate in having Cedar planks in house. They were a foodie gift and I look forward to every opportunity to use them. 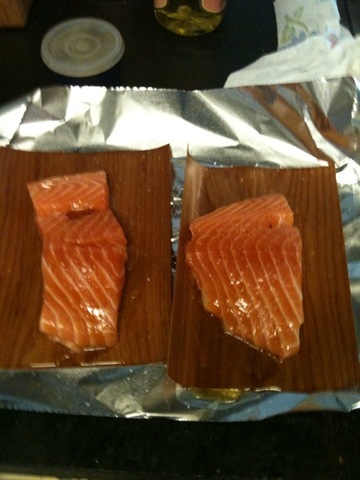 I have some Maple syrup and will rub my salmon down with it before placing it on the grill. For the grilled corn I know there are several schools of thought. 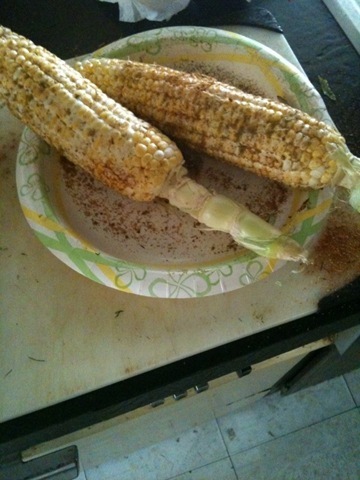 One involves soaking the husk (and corn) and putting it on the grill. To me, this only steams it! Grilled corn, to me, is fresh corn rubbed with butter and spice and thrown directly on the grill until slightly charred. I like chili powder and cumin. To finish the menu I like Dilled Potato Salad. The potatoes are Michigan new potatoes. 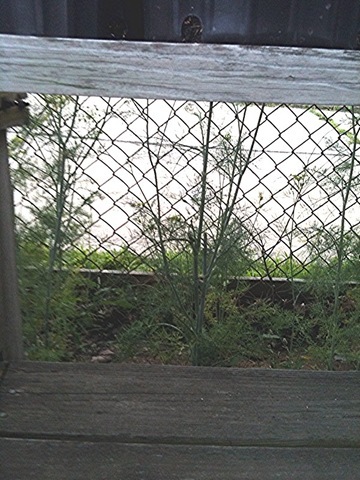 The dill grows wild around my house ( I love to forage!). I also have oregano, basil, rosemary and mint that grow wild around my house. In my last post I alluded to my new position.I wanted bring you up to date with my current status. I am currently in Grand Rapids Michigan. I am living on-site and ( doing what I do) creating/implementing first rate dining services programs. I do return to my house in Detroit weekly. For the last 2 weeks I have enjoyed the Downtown Blues Festival in Grand Rapids Little Ed was the first week and Duke Robilard appeared last week. 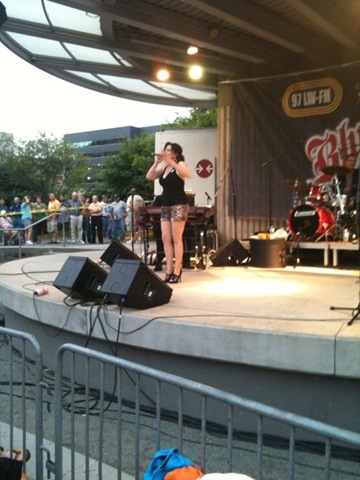 This week it was Janiva Magness. Last week we had our first Al Fresco Dining event and it went very well. We had literally twice our usual number participants joined us.We will be doing this weekly as long as the weather allows. Our resident love what we are doing!! We have a wonderful Chef Manager who has a great relationship with our residents. Michigan has great small cities. 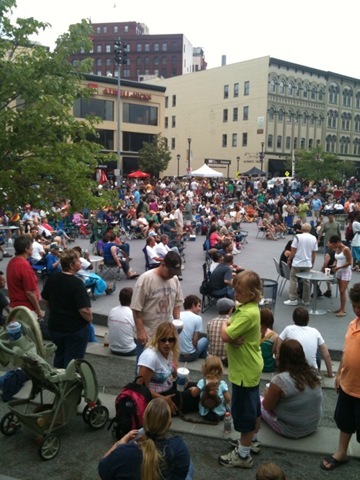 Lansing, Ann Arbor, Flint and Grand Rapids each host an variety of cultural events. 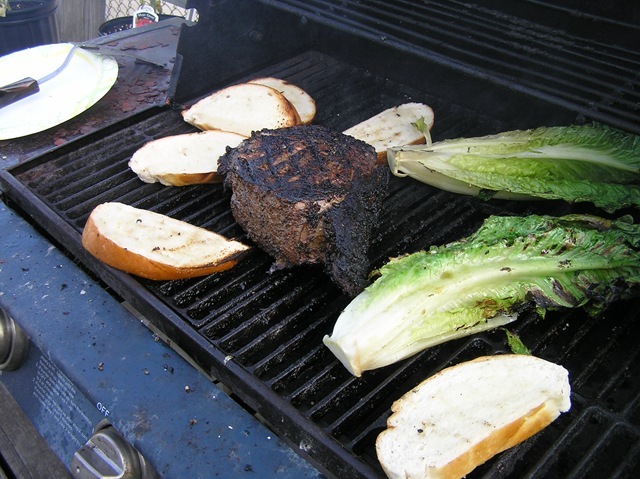 My favorite meals lately has been steak with grilled romaine lettuce. 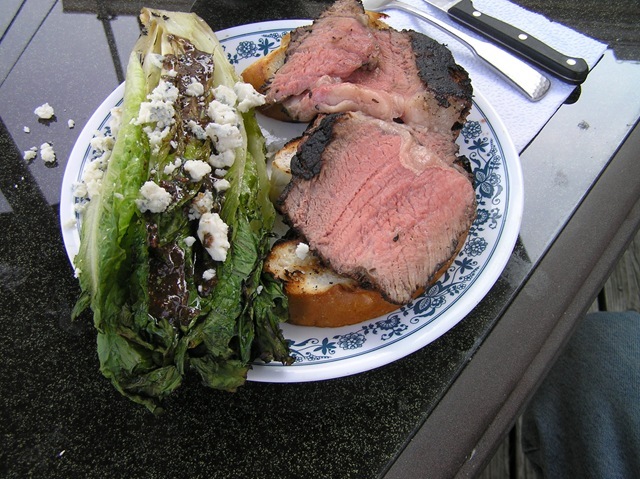 I top the lettuce with an herb vinaigrette ( herbs from my garden) and Maytag Blue Cheese, as well as marinating the steak in fresh herbs from my garden. I am fortunate to have a butcher shop in my neighborhood and they will cut steaks to my specifications. I prefer to have my steaks cut to about 2 # and grill/roast when cooking. The Romaine lettuce I drizzle with the vinaigrette after I have topped it with the cheese and slice the steak thin. One of my favorite meals is BBQ ribs. I don’t get to have them as often as I like due to the fact that my wife doesn’t eat pork. This time, however, I came up was offered a solution. The BBQ gods, in their infinite wisdom, decided that beef rib and pork ribs should be on sale at the same time. Now I haven’t an opportunity to do beef ribs on the BBQ before but I figured the process shouldn’t be any different. Beef ribs, by the way, are the bones that are attached to a prime rib so they were nice and meaty. The first step was to brine the meat. 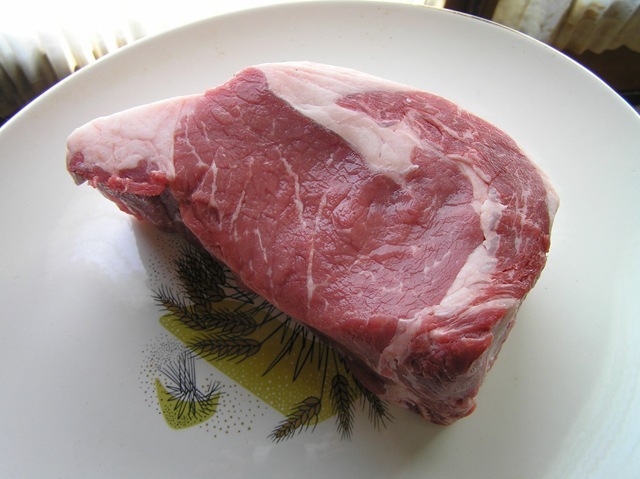 This step helps to ensure that the meat stays moist and flavorful. While there are a lot of brine recipes out there I chose to keep it simple. I brought 1 cup of Kosher salt, 1 cup of brown sugar and 1 gallon of water to a boil the night before. Considering the ingredients I wasn’t concerned about any type of spoilage so I just left the pot (covered) on the stove to cool overnight. I also took the opportunity to remove the membrane from the back side of the ribs. Without this step the membrane would make the ribs tough. The next morning I placed my ribs in the brine and put the pot in the refrigerator for 4 1/2 hours. After removing your ribs from the brine pat them dry with a paper towel. Then rub both sides of your ribs and allow to sit (refrigerated) for at least 1 hour. While your ribs are resting you can be soaking your wood chips. There are several types of wood that can be used. I like hickory the best but many people will use oak,apple cherry or pecan. I will use mesquite when I am grilling (as opposed to BBQing). Mesquite burns at a very high heat and as such is great for steaks and chicken or anything you want to sear and cook quickly. The rule about BBQ is to cook low and slow. I build my fire on one side of my grill and put a drip pan full of water on the other side. 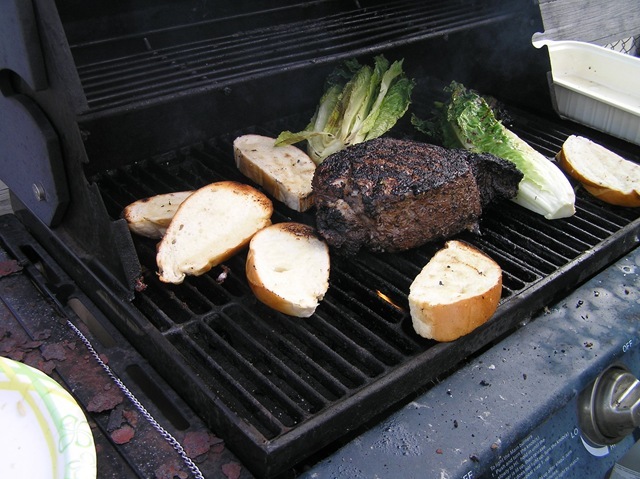 I also make sure to always have a thermometer inside the grill so I can monitor the temperature. Ideally I like to cook between 225 and 250 degrees. I control the temperature by using the vents on the top and bottom of the grill (I am currently using a Weber Kettle), as well as, partially opening the lid if necessary. Having taken all these steps I am now ready to put my ribs on. I place the as far away as I can from the flame (over the drip pan) and sprinkle the moist chips on the fire. 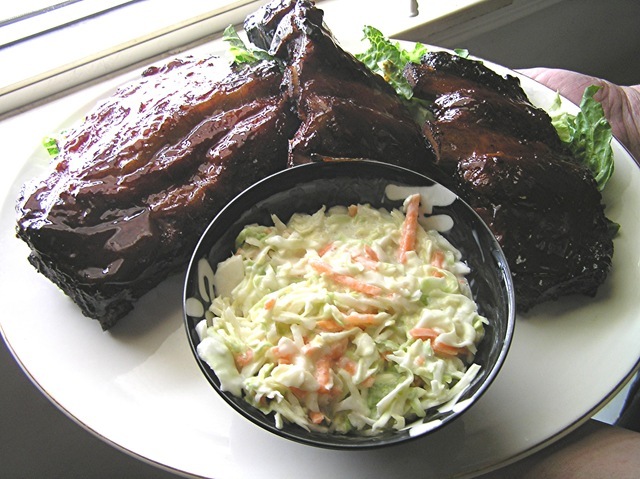 It takes approximately 4 to 4 1/2 hours for the ribs to finish. One additional step I take to keep them moist is to have a squirt bottle filled with apple juice which I use to make sure the top of the ribs stay moist. When the bones just start to pull away from the meat the ribs are done. The final step before feasting is to sauce the ribs. While some BBQ experts will tell you that good BBQ need no sauce I prefer it. I do find that a simple homemade sauce is often far superior to a store bought sauce. I think that too many ingredients are added when a less is more approach should be used. ketchup,cider vinegar and brown sugar are all you need although this time I had some maple syrup in the house and used it to replace some of the brown sugar I would normally use. This was a great decision as the sauce was spectacular. It should be noted that , due to the sugar in BBQ sauce it should be added only at the end of the BBQing process. I like to use a baby back rib. I find it more meaty (and less fatty) than a St. Louis rib. While you can find inexpensive ribs remember that you get what you pay for so if the deal seems too good to be true it probably is. You could end up paying for all fat. The beef ribs worked exactly as expected and were very meaty and moist. I didn’t add a sauce recipe here due to the fact that my sauce only has 3 ingredients (4 with maple syrup but that’s optional). Just mix the three ingredients together until you get the balance of tart and sweet you are looking for and remember it’s not necessary to add every spice in the cupboard! Wood chips can be purchased at Lowes,Home Depot, K-Mart etc. Watch the pricing. You shouldn’t have to pay more than 4 or 5 buck for a bag that will last you most of the summer!